When did robo-signing evolve to become defined as benefiting borrowers? The article from Reuters is the typical standard operational bull*** practice of blaming the victims as if the borrowers had any idea that robosigning was going on at the time that they signed the loan documents. 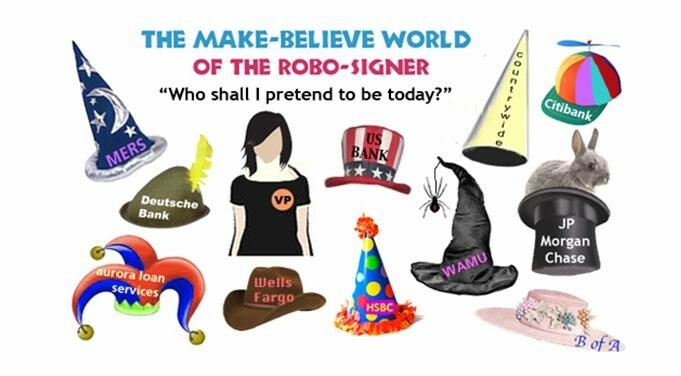 Robo signing was NOT the cause, it was just a symptom of the greatest ponzi scheme in world history which had the side benefit for the bankers of looting much of the wealth of the middle class. REMIC trusts started off as a good idea but quickly became scams that demanded vast amounts of mortgage loans to be packaged in these trust vehicles. They were advertised as insured and safe, which was not true. These things were sold to pension funds, retirement funds, 401ks and other investment funds which ultimately looted the wealth of the middle class. Robo signing was the result of the banks and other entities involved in the trusts failing to follow the requirements of the trusts Pooling and Servicing Agreements. The notes were supposed to be endorsed each step of the way. Had that been done, foreclosures would have been clean and fast. The banks did not want to spent that money or put in the effort, so they created MERS to try to keep track of everything. Thus, because transactions were not recorded and notes were not endorsed, as foreclosures climbed, to prove standing when none actually existed, They used robo signers to create fake documents to create a paper trail they could sell to the courts consisting of allonges and assignments, plus other paperwork. This is often why mortgage assignments are created for foreclosures and are executed many years after the notes and mortgages were supposed to have been deposited into the REMIC trust. Virtually every mortgage assignment is a fraud in one way or another. They are made to appear as contracts but they are no such thing. There never is any acceptance. The trust and trustee does not pay a cent so there is no consideration. They are usually done in the name of the original lender which has been out of business for years. No trustee would ever actually accept the deposit of a mortgage and loan into a trust years after it is closed much less from an entity that is not a party to the trust. It is all evidence fabrication from whole cloth. I’m certain that my description is more accurate, and more precise, than that offered either by “investopedia,” or Mr. Stempel.